Comprehensive and competent pump and valves service by KSB: our KSB on-site service ensures that coordination is kept to a minimum. This saves costs and time for our customers. 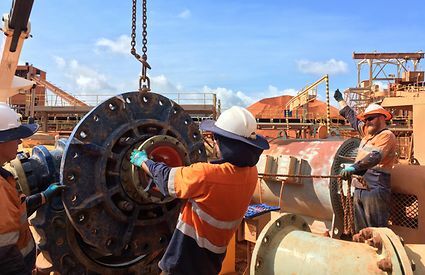 KSB service technicians on-site at one of Australia's largest bauxite mines, assisting with a large mineral processing pump. KSB Australia KSB’s pump and valves service, ranging from expert planning to implementation, is ensured by experienced and highly qualified KSB specialists providing support to our customers as part of KSB’s on-site service. In the event of a failure, KSB is able to respond quickly. KSB’s on-site service includes the inspection and repair of pumps, pumping systems and motors of all makes. In the event of unscheduled downtime, in particular, mobile KSB specialists are quickly on site, at any time across Australia. KSB Service offers a variety of maintenance inspection management services for mineral processing plants, power stations and other industrial plants such as refineries or steam crackers. Specialists inspect and repair pumps sets within the shortest of downtimes.